England defeated India by seven wickets in the fifth and final ODI played at Dharamsala to earn a consolation win, although they had already lost the series. England had won the toss and elected to field. English bowlers did a good job by restricting India to 226. Tim Bresnan, Steven Finn and James Tredwell were all brilliant in their spells. At a height of 1317 metres above sea level, the Himachal Pradesh Cricket Stadium is among the highest international grounds in the world. India initially had a disastrous start as five wickets had fallen for 79 runs only. Bresnan got the breakthrough for England, removing opener Rohit Sharma for just 4 runs. On the very next ball, he got Virat Kohli out for naught. Soon after, it was Yuvraj’s turn to return to pavilion who played 14 balls but could not score a single run. He was out on a delivery by Finn. He also got rid of skipper Dhoni who was out lbw for 15. With the collapse of top order, it was left to in form Raina who had a 78 runs partnership with Jadeja, to ease off the things for India. 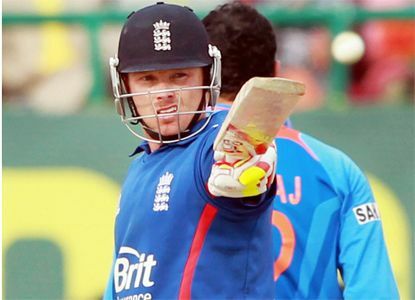 Raina was out for 83 by Woakes. It was his fourth ODI fifty in as many innings. India managed to give England a total of 226 runs. Tim Bresnan was he most successful bowler taking 4 for 45 runs. It was his fourth haul of four or more wickets in ODIs.